Mi Ketz, means “at the end” or “completion”. It was the end of two full years, from the time the butler and baker were released from prison (on Rosh Hashana) till Pharoah dreamed and the wine bearer remembered his promise to Yosef (Joseph). His experience in prison must have been akin to what we feel when we have the call of God on our lives and have to wait, sometimes years, to carry it out. He demonstrates for us the best way to spend our time, serving our Master diligently as the scripture says “whatever your hand finds t o do, do it with all your might” Eccl. 9:10 By doing this, Yosef’s endured the situation in patient service to Yahweh and his character was strengthened and prepared for the calling on his life. Although it took many years, Yosef went from slave to prisoner to head of Pharaoh’s kingdom. The transitions were overnight. It looked to him as though it would never come but when it finally came, it seemed instantaneous. As a result of his faithfulness, he was in due time advanced to leadership in the kingdom. When the time was right and the vessel was prepared, the situation changed. Promotion Comes From Yahweh In the courts of Egypt and Mesopotamia, they had men who professionally interpreted dreams (International Bible Encyclopedia Vol.1 p.992) and so their inability to interpret Pharaoh’s dream was significant and was divinely used to fulfill Yahweh’s purposes to bring Yosef to his ordained role in life. The cupbearer had forgotten Yosef but Yahweh had not, and although Yosef’s faith was tested, Yahweh was faithful to His Word, and the gift which He had given him of interpreting dreams, made way for him. Under the circumstance, the Chamberlain of the Cup Bearers decided that his own self-interest dictated that he remember Yosef and tell Pharaoh about him. The chamberlain began his declaration by making a point of his great devotion to the king: “Even though I will have to recall my sins to make this revelation, I will do it for the sake of your majesty — to tell you of my personal knowledge of an interpreter” On his recommendation, Pharaoh has Yosef immediately released and brought to him. The scripture reads, “And they rushed him.” Sometimes divine salvation comes hastily and unexpectedly. We need to remember that in our timetable Yahweh may appear to be slow or late but in his timetable, He is never late and His timing is perfect. When Yosef was summoned before Pharaoh, his initial words were a bold disclaimer of personal ability and a confession of faith in the only true and living God. “That is beyond me; it is Elohim Who will respond with Pharaoh’s welfare” or “It is not in me; Elohim will give Pharaoh a favorable answer.” (41:16) Daniel, too, ascribed his powers solely to God. Daniel 2:30 “But as for me, this mystery has not been revealed to me for any wisdom residing in me more than in any other living man, but for the purpose of making the interpretation known to the king, and that you may understand the thoughts of your mind.” Yahweh says in 1 Samuel 2:30, “Those who honor me I will honor.” Humbly, Yosef and Daniel gave credit to the One to Whom credit was due, refusing to accept the implication that they had any supernatural powers. Their integrity would not permit them to accept credit themselves, despite the real danger that these might be executed if there was nothing extraordinary about them and their message. 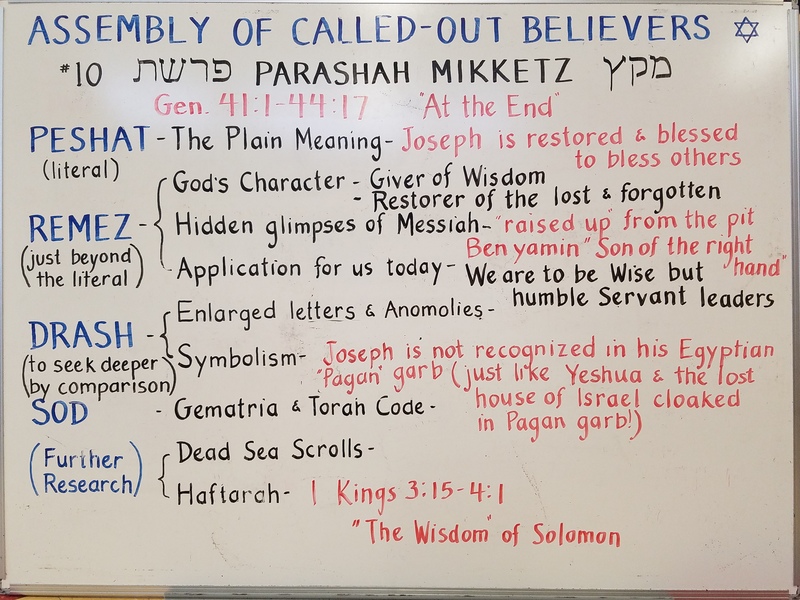 Yosef is given a new name which according to Rashi and Flavius Josefus, the name Tzafnat-Paneach means, “he who reveals secrets”. “Tzafnat” could come from the root “tzafan”, which means “hide”, “keep secret”. The Septuagint and the Coptic version translate the name as “savior of the world”. Yosef as the vice-king plays out two critically important roles of leadership; he actively deals with matters of state along with matters of economics (ibid. 42:6). On the one hand, Yosef is personally living out his own dreams of Parshat Vayeshev 37:7-9 – that of a being a provider linked with that of being a ruler. Yosef remembers the dreams and recognizes their long-range significance. Watch your step! “And Pharaoh said to Yosef, `Behold ­ I have placed you over all Egypt. '” (41:41) Commentators say that Pharaoh was cautioning Yosef, as if to say “See and consider well. Make sure that you conduct your affairs so that they reach their proper conclusion. For I have placed a great matter in your hands.” Why was it necessary for Pharaoh to caution Yosef in this manner? Pharaoh had already recognized that Yosef was a man of God, unparalleled in wisdom and perception. Surely, such a person can be relied upon to do everything necessary to avoid disaster and rescue the world from hunger. And yet, Pharaoh did caution him. Could it be that even Yosef, a man of Elohim who was fully aware that even the slightest error may bring disaster ­ even such a man must check his every action with Yahweh, his God and Father, to avoid a false move that could be out of his will and thus devastating to those Yahweh is trying to bless? Yosef has been raised by Yahweh from the pit from which he was sold into slavery to be second only to Pharaoh in a period of 13 years. Yahweh has prepared him for this great responsibility which begins at age 30. This is a significant age in the Israelite society for it is the time when a man is sufficiently mature to undertake his life’s work. Yeshua began his ministry at age 30. The Unfolding Drama The brothers come to Egypt for food and bow before him (42:6). This was part of Yosef’s dream which was fulfilled when all the family came down and bowed before him. He begins to implement a plan to test his brothers and assess the situation, and determine how he is to work toward the fulfilment of the prophetic dream. Their conscience was being activated. Now they were in a similar situation again, and had the chance to make restitution by not abandoning Rachel’s other child Benjamin or deceiving their father this time. Then he returns their money into their sacks unknown to them at the time, and they return home. In ancient times, every country would put its own insignia on its currency and the value was based on the weight of the gold and the silver. From many lands people came to Egypt to purchase food. The Egyptians would weigh the currency and sell to them accordingly. The brothers related that when they opened their sacks, they found money, “Bemishkalo” – which weighed exactly the same as the money they had given for their purchase. However, the emblems engraved on the coins were not the same because, “We brought other coins with different emblems when we came to buy food. Therefore, we are puzzled and do not know who put silver of the same weight as our money in our sacks.” This would have had deep significance as it meant that someone had exchanged the money to the same value they had brought. An ingenious plan unfolds as Yosef controls the situation to have Benjamin come down to Egypt and then uses him for the ultimate test on his brothers. Yosef invites them as guests for lunch sitting them in order of birth and so begins the penetration of their consciences for the final act. The major problem between the brothers and Yosef was jealousy. Due to their jealousy of his aspirations to rise above them, they went as far as selling him as a slave. When the brothers were invited to a meal in Yosef’s house, Yosef put them to a test to see if they had overcome this negative trait. He gave Binyamin five times as many presents and food as he gave them, and waited to see how they would react. In Benjamin’s sack he has placed his own personal silver goblet. They depart for Canaan but are stopped and searched. The brothers are bewildered when the goblet is found in Benjamin’s sack. They are escorted back to Yosef, who orders the guilty one, Benjamin, to be kept as a slave while the rest are to be set free. The brothers would be put to the test so Yosef could see if they had changed since they turned on him and sold him into slavery (44:8-17). Yosef is overcome with emotion during these encounters with his brothers and evidences deep feelings for them. These insights into the heart of Yosef are indications of his deep love for the Creator as well as the passion he has for his family. In all his dealings with them, it is obvious that his heart is toward Yahweh to fulfill His purposes. The Final Scene Yehudah offers to be a guarantor for Benjamin to his father. He uses two legal terms to indicate what he was willing to be for Benjamin to his father if something happens to him. The first term ‘surety’ is saying that he offers to repay the loan should the borrower default, and secondly the term ‘require’ is to be held responsible for, or accountable for. So Yehudah is putting himself in a position to be held accountable for whatever happens to Benjamin, promising to restore whatever loss to his father will be involved in taking him. Genesis 43 Obviously Ya’acov must have deep trust in Yehudah to finally allow him to take Benjamin back with him. Judah (Yehudah) and the brothers, including Binyamin, return to Egypt where they are received by the “junior” Pharaoh, Yosef. After inquiring about his father’s welfare, Yosef treats the brothers lavishly as honored guests. He sets places at the dining table for them in the order of their birth and feeds them from his table, giving Binyamin five times as much as the others to see if the brothers become jealous over this preferential treatment of him. The brothers are amazed by these actions but they do not react negatively. However, when Yosef finally sees his youngest brother, Binyamin, he can barely control his emotions. He rushes out of the room and weeps. After selling more grain to the family, Yosef secretly instructs his servants to again replace the money in the sacks of each man, and in addition, to put his goblet inside Binyamin’s sack. When the goblet is discovered and the family is returned to his presence, Yosef accuses them of being thieves and demands that Binyamin become his slave as a punishment. So, like a good serial drama, the Parsha ends on a cliffhanger note. Yosef is setting a stage to see how will the brothers will react with of another of his mother’s sons being taken from the family. Though not included in the haftorah, in this dream God granted King Solomon his legendary wisdom. The haftorah relates a famous episode that made all of Israel aware of their new monarch’s keen intellect.